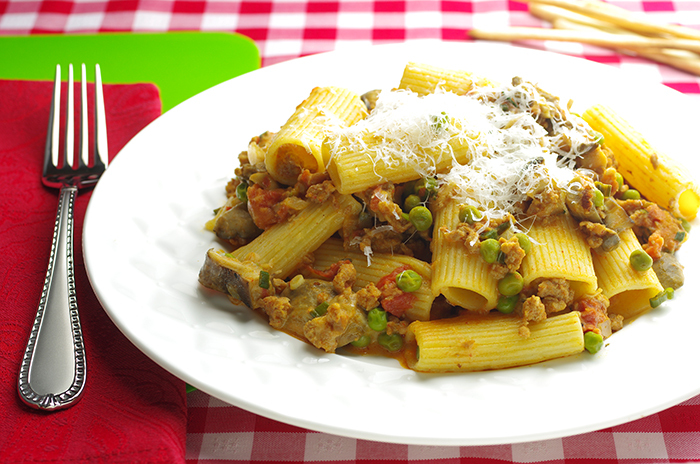 This is a recipe that everybody loves, easy to make and exemplary of Italian home cooking. Its roots are most likely somewhere with the shepherd community of the Apennines. 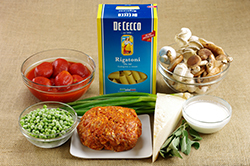 Traditionally, it includes pasta, ricotta, and some meat in a casing, like sausage or salami. The other ingredients are delicious contemporary additions. 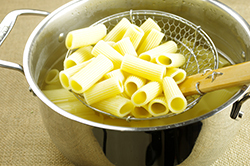 Bring a large pot of salted water to boil for pasta. 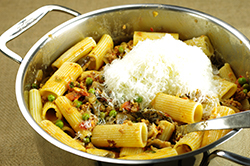 Slip the rigatoni into the pasta water, and cook until al dente. Heat the olive oil in a large skillet over medium heat. 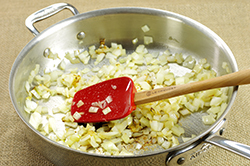 Add the onion, and cook until softened, about 4 minutes. 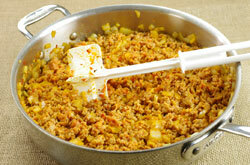 Add the sausage, and cook, crumbling with a wooden spoon, until the sausage is no longer pink, about 4 minutes. 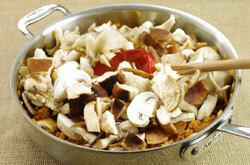 Add the mushrooms, then cover, and cook until the mushrooms release their juices, about 2 minutes. Uncover, and add the sage and tomatoes. 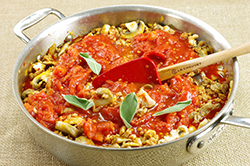 Bring to a simmer, slosh out the tomato can with 1 cup pasta water, and add it to the sauce, along with the salt. 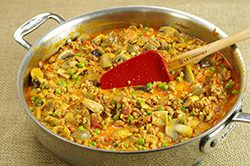 Bring the sauce to a simmer, and cook, uncovered, until thickened, about 10 minutes. 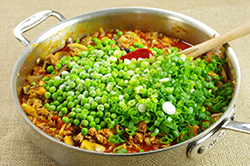 Once the sauce is thickened, toss in the peas and scallions. Cook until the scallions wilt, about 2 minutes. Pour 1 cup pasta water and the heavy cream into the sauce. Bring to a boil, and cook until thickened, about 2 minutes. When it is cooked, remove the pasta with a spider and add directly to the sauce, tossing until the pasta is coated. Remove from heat, and sprinkle with the grated cheese. Toss again, and serve immediately. Recipes from Lidia’s Italy in America by Lidia Matticchio Bastianich and Tanya Bastianich Manuali. Copyright 2011. Published by Alfred A. Knopf, New York, NY. Reprinted with permission of the publisher. All rights reserved.